ICLEI provides a broad range of globally accessible programs and concrete tools to help cities transit to more sustainable urban management, covering the areas of urban design, eco-budgeting, urbanization, sustainability management and eco-procurement. The carbonn Climate Registry is a global reporting platform for cities, towns and regions tackling climate change. It helps local and subnational governments to track and report on their targets, actions and performance. Managed by ICLEI USA, ClearPath is the leading online software platform for completing greenhouse gas inventories, forecasts, climate action plans, and monitoring at the communite-wide or government-operations scales. 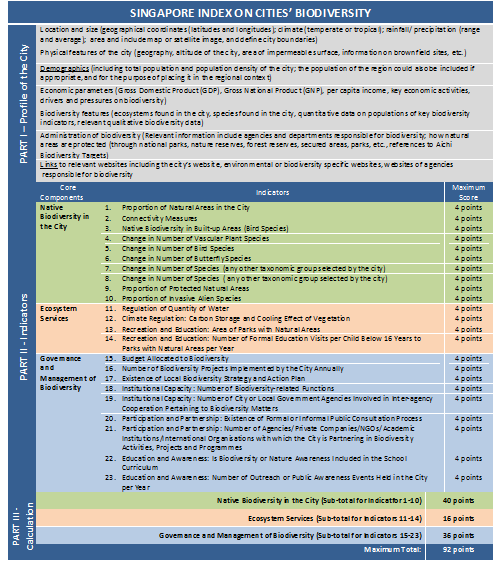 Developed for local governments by experts under the guidance of ICLEI Europe, the Convenant CapaCITY Training Platform addresses 8 topics relevant to Sustainability Energy Action Plans (SEAPs). 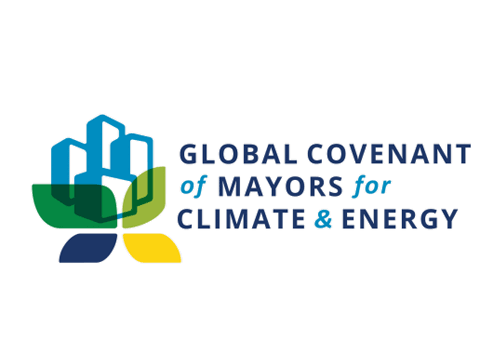 The Global Convenant of Mayors for Climate & Energy (formerly the Compact of Mayors) is the world's largest coalition of cities to tackle climate change. It is a common platform of capturing the collective impacts via standardized measurement of Greenhouse Gas (GHG) emission and climate risk, and consistenly reporting the participants' efforts and achievements. GPC, the Global Protocol for Community-Scale Greenhouse Gas Emission Inventories, is a joint project by ICLEI, the World Resources Institute, and C40 Cities Climate Leadership Group, with additional collaboration by the World Bank, UN Environment, and UN-Habitat. As a global reporting standard, the GPC enables cities and communities to consistently measure and report GHG emissions and develop climate action plans and low-emission urban development strategies. The Harmonized Emissions Analysis Tool plus (HEAT+) is ICLEI's multilingual online inventory tool for local governments to account for GHG emissions, Common Air Pollutants (CAP) and other Volatile Organic Compounds (VOC). Run by ICLEI Europe, the Toolbox is a growing collection of resources valuable for all local governments addressing climate and energy. Run by ICLEI USA, ADAPT, the Adaptation Database and Planning Tool guides cities through ICLEI's five milestones for climate adaptation. Published by ICLEI Canada, Changing Climate, Changing Communities: Guide and Workbook for Municipal Climate Adaptation is a compendium of resources that provides a framework to assist local governments in creating adaptation plans to address the relevant climate change impacts associated with their communities. ecoBUDGET® is an environmental management system developed by ICLEI Europe based on the logic of municipal budgets to help local governments manage natural resources. Financing the Resilient City is a ICLEI white paper on the benefits of a bottom-up and comprehensive resilience investment approach to development, disaster risk reduction and climate adaptation. The ICLEI Resilience Resource Point provides a gateway into the growing collection of websites, networks and literature dedicated to adaptation and resilience, with a particular focus on urban regions and cities. Launched in 2010, Resilient Cities is the global platform for urban resilience and climate change adaptation, hosted annually in Bonn, Germany. Topics such as urban risk, financing resilience, ecosystem-based adaptation, and integrated planning approaches are covered by the congress. The Transformative Actions Program (TAP) is an innovative initiative that aims to catalyze and improve capital flows to cities, towns and regions and strengthen the capacity of local and subnational governments to access climate finance and attract investment for adaptation and mitigation projects. Also known as the Singapore Index on Cities’ Biodiversity or the Singapore Index, the City Biodiversity Index is developed and maintained by the Singapore National Parks Department with support from ICLEI, the CBD and others. It is the only biodiversity index designed specifically for monitoring and evaluating biodiversity in cities, and the first self-assessment tool to help local governments benchmark their biodiversity efforts. 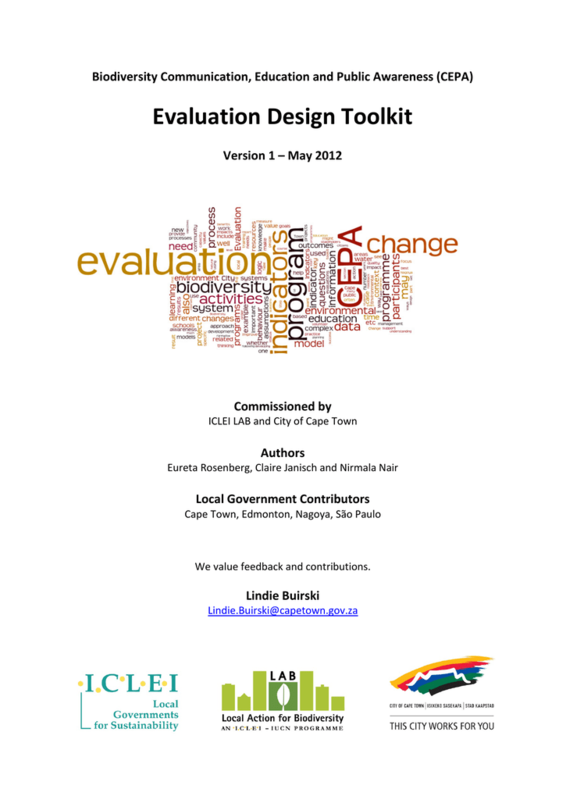 Developed by ICLEI and the City of Cape Town, the Communication, Education and Public Awareness (CEPA) Evaluation Design Toolkit enables cities to evaluate, track and measure the effectiveness and impact of their communication, education and public awareness campaigns on local natural resource management. The Local Action for Biodiversity (LAB) is ICLEI's flagship biodiversity program coordinated in partnership with IUCN. Action-oriented and customized for local and regional authorities and their partners, the program aims to improve biodiversity management at the local level. LAB is a key component of, and contributor to, the CBD's Global Partnership on Local and Subnational Action for Biodiversity. LBSAP is the local-level version of National Biodiversity Strategy and Action Plans (NBSAPs), the principal instrument used by national governments for implementing the Convention on Biological Diversity. Co-authored by ICLEI Cities Biodiversity Center, the United Nations University -- Institute for Advanced Studies and the CBD Secretariat, the LBSAP Guidelines support local governments in both developing broad strategy and detailed actions for implementation in protecting and enhancing local biodiversity. Produced jointly by IUCN (the International Union for Conservation of Nature), the CBD Secretariat and ICLEI, the Local Action for Biodiversity Guidebook: biodiversity management for local governments provides practitioners with comprehensive guidelines on various aspects of biodiversity management at the local level. Hosted by ICLEI Cities Biodiversity Center and coordinated by the Stockholm Resilience Center, URBIS is a global network connecting acclaimed scientific researchers, foresighted policy-makers, visionary planners and environmental practitioners from across the world with local governments to share, develop and implement ideas for creating more resilient and equitable urban regions. The EcoMobility Alliance is a group of enthusiastic local governments aiming to implement urban mobility strategies that prioritize people and the environment. The EcoMobility SHIFT is a methodology designed for cities to measure their performances and progresses regarding urban mobility with a set of 20 indicators in various areas. The EcoMobility World Festival is designed to demonstrate green mobility in local neighborhood through month-long celebration and revitalizing streets in communities. The EcoProcura Conference series is the only European-wide forum to promote exchange and dialogue amongst purchasers from all levels of governments, suppliers, policy-makers and multipliers on strategies and the latest practical solutions on Sustainable Public Procurement. It has also been replicated in China. Coordinated by ICLEI, GLCN is a group of cities committed to move towards sustainable procurement, consumption, and production. The Sustainable Procurement Resource Centre is a one-stop access point for procurers, policy makers, researchers and other stakeholders. It contains key knowledge on how to effectively undertake sustainable procurement, saving local governments money and driving the market towards sustainable solutions.